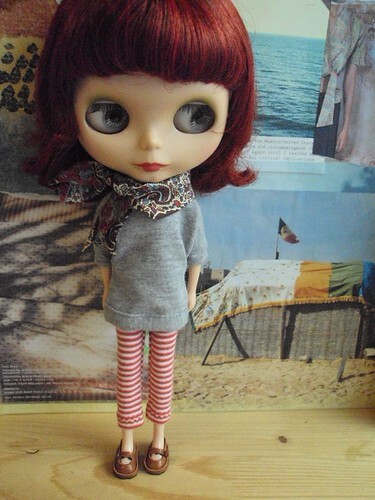 Casual Lemony, a photo by little_moshi on Flickr. It's funny sometimes how the creative process works. It can start with an intention to do one thing and then end up with you going in a different way altogether. This week I knew I had some really nice striped jersey and I thought that I would make some leggings to go with nice boho style dresses. I made the leggings and then made the dresses, but the dresses looked better with tights so I thought I would leave them. But I had these leggings now and nothing that would go with them. So I thought that what would be good was some sloppy batwing t-shirts, so I made one to test the pattern. I made it from some old grey cotton jersey, just to see how it would turn out. It was really cute, and I was hugely impressed with my sewing machine's ability to cope with jersey. So I made some more and then made some scarves to go with them to give them a frenchy look. Then I thought I would experiment with some more shapes and made a more fitted top with a funnel neck, but then they had no trousers to go with them. So I made some plaid pants in some of my favourite indian cotton. They looked really cute. Anyway the upshot of this is that we have ended up with a whole range of relaxed outfits, completely unintentional, but I like it when that happens. Sewing for small plastic people..